This is a fun item. It is a seven piece, ready to go, Agility Set for Hamsters, Gerbils, or Mice/Mouse. You could also use this set for training young (small) rats/rat/ratties. PLEASE NOTE: Some of the wood pieces may have a warp to them. 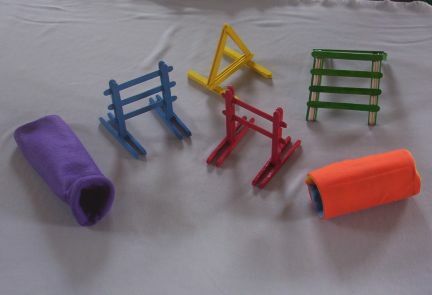 We have made sure this equipment is safe and stable for the tiny little agility competitors. Check for other color choice in our Agility Equipment catagory of our sales items.